Commissioned by Second Movement as part of New Music 20×12. Special thanks to Jerwood Charitable Foundation for making this commission possible. Zátopek! 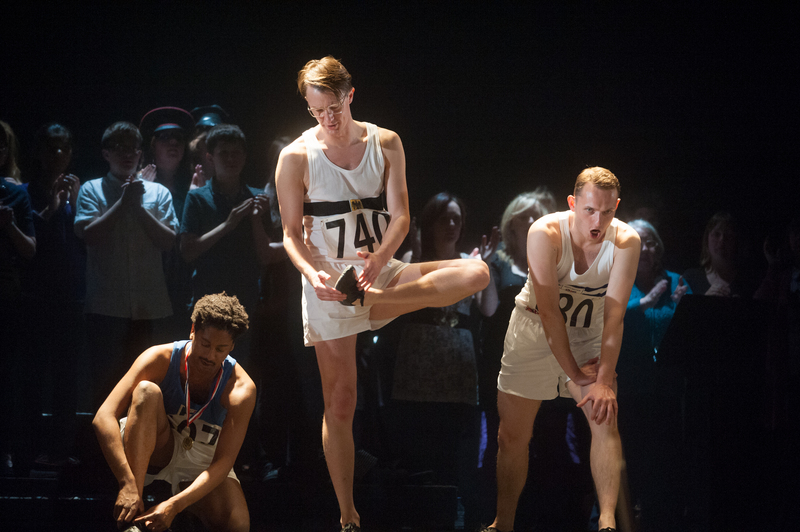 is a 12 minute opera inspired by the life and times of legendary Czech long distance runner Emil Zátopek. Zátopek! formed part of PRS for Music Foundation’s New Music 20×12 which supported the creation of 20 new pieces of music for the Cultural Olympiad. The world premiere of Zátopek! took place on 15th June 2012 at the Epstein Theatre, Liverpool, presented by Second Movement in partnership with Liverpool Philharmonic. The performance was broadcast on Hear and Now on BBC Radio 3 on 16th June and is available for download from NMC Recordings at www.nmcrec.co.uk. The Medium is a gripping tale of the sinister world of the seance, where Madame Flora’s meddling with the supernatural leads to the revelation of a terrible secret – and a horrifying descent into madness. 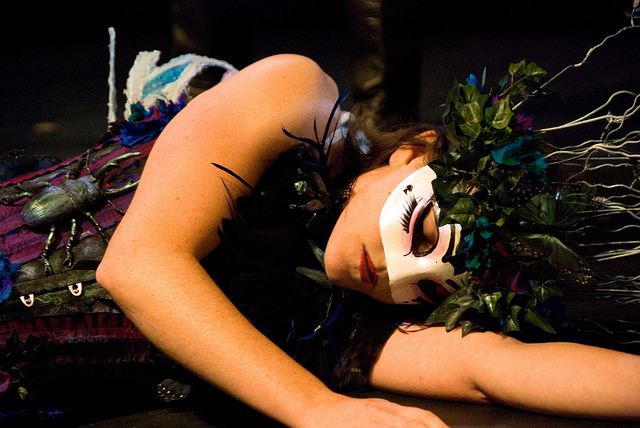 A revival of Second Movement’s 2006 London production. 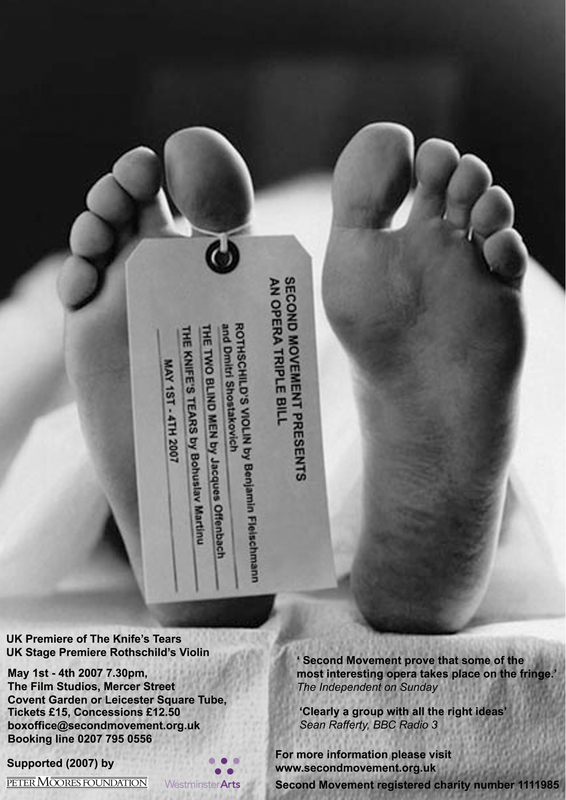 In 2010 Second Movement was invited by Brno based company Ensemble Opera Diversa to perform its 2007 UK premiere production of Martinů’s The Knife’s Tears in the Czech Republic. We performed this unique jazz inspired surrealist work in our English translation, alongside two operas produced by Ensemble Opera Diversa, Ela, Hela a Stop by Lukáš Sommer based on a text by Václav Havel and Dýnový démon ve vegetariánské restauraci by Ondrej Kyas, libretto by Pavel Drábek. We were delighted to be able to perform Martinů’s chamber opera in the composer’s homeland and would like to extend our thanks to all at Ensemble Opera Diversa and Skutečnost, our hosts in Prague. Second Movement presented scenes from this work, previously unseen in the UK at Tête à Tête: The Opera Festival, August 2010. The piece, composed in 1929 in Paris in collaboration with leading surrealist, Georges Ribemont-Dessaignes, is a genre-bending experimental work which fuses live opera and film, jazz and modernism, fantasy and social satire. A new production of Barber’s classic 12 minute opera. Barber’s wittily compressed masterpiece unflinchingly dissects sexual repression and desire, in a game of cards which reveals people’s darkest and innermost thoughts. Albert and Getrude arrive at their new eco home filled with hope for the future. But, as the light fails, the house begins to feel more and more isolated. Why are the phones not working? And what exactly is happening ‘over there’? Stefan Weisman’s gripping brand-new opera conjures an atmosphere of increasing menace in a short, sharp tale of a new home and broken lives. World premiere. A revival of our 2005 production. Written by one of the all-time great masters of American music, Trouble in Tahiti is both a searing indictment of apple-pie suburbia and a haunting exploration of marital breakdown. With the jazzy inflections and raw emotionalism of his best work, Bernstein painfully dissects the American Dream – and what happens when it turns into nightmare. A black comedy containing some of Offenbach’s wittiest music, The Two Blindmen is a short satirical opera with a brand new script by Michael Flexer. In honour of Shostakovich’s centenary year, Second Movement presented the first fully staged production of Rothschild’s Violin in Britain. A piece close to the heart of the twentieth century’s greatest composer, this powerful and moving opera based on a Chekhov short story was completed by Shostakovich after the death of his student Benjamin Fleischmann in the Siege of Leningrad. Never before performed in the UK, The Knife’s Tears is an effervescent 1920s jazz opera by Czech composer Bohuslav Martinů, best known for his operatic fantasy Julietta. Containing influences as far ranging from ragtime, surrealism, pungent modernism and traditional Czech folk music, Second Movement’s production of The Knife’s Tears was a rare chance to hear a forgotten masterpiece. Written at the same time time as The Marriage of Figaro, Mozart’s hilarious satire on the foibles of opera singers, producers and the theatre remains as fresh as ever in this newly commissioned adaptation from young playwrights, Michael Flexer. Menotti’s most powerful score, The Medium is a gripping portrayal of the sinister world of the seance: Madam Flora’s meddling with the supernatural leads to the revelation of a terrible secret – and a horrifying descent into madness. Written by one of the all-time great masters of American music, Trouble in Tahiti is both a searing indictment of apple-pie suburbia and a haunting exploration of marital breakdown. With the jazzy inflections and raw emotionalism of his best work, Bernstein painfully dissects the American Dream – and what happens when it turns into nightmare. Cast: Paul Carey-Jones; Jane Harrington, Alastair Merry; Hannah Pedley; Tom Raskin. The company’s inaugural production was Mozart and Salieri, Rimsky-Korsakovs opera miniature based on Pushkins Little Tragedy of the same name which turns on the fabled murder of Mozart by his jealous and inferior colleague Salieri. This fully staged opera was paired with a first half performance of Rachmaninovs Vespers.